Happy Black Thursday: Do Tumbling Buybacks Signal Another Market Crash? In other words, fixing the price of money at zero for years-on-end, increases financial instability while doing nothing for the real economy. The IMF is basically admitting that the Fed has created the conditions for another meltdown. 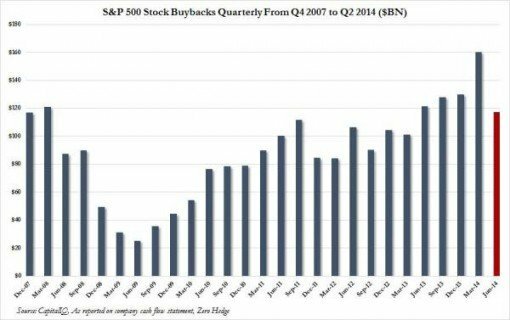 “Preliminary data showed stock buybacks reached $116.2 billion in the second quarter … down 27% from $159.3 billion recorded for the first quarter of this year, the second highest on record. 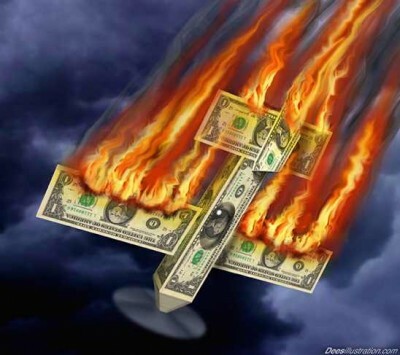 So you want to know why stocks keep soaring higher on so-so economic data? If buybacks represent 20 percent of the total value of stocks today, then what’s going to happen when conditions change, that is, when QE ends and rates rise? Stocks are going to tumble, right? “In the first six months of this year, the company spent more than $12 billion … on its own shares … But all these “shareholder friendly” maneuvers have been masking an ugly truth: IBM’s success in recent years has been tied more to financial engineering than actual performance. While the company spent $138 billion on its shares and dividend payments, it spent just $59 billion on its own business through capital expenditures and $32 billion on acquisitions. …All of which is to say that IBM has arguably been spending its money on the wrong things: shareholders, rather than building its own business. But IBM is no different than anyone else. They’re all doing the same thing; “dissipating corporate assets” and “shrinking their businesses” (Yves Smith) to enrich greedy executives and their voracious shareholders. And who can blame them, after all, these corporations are merely responding to the incentives created by the Fed’s monetary policies. Stock buybacks make perfect sense when credit is easy and the price of money is zero. So why did stock prices plunge last week? “Goldman Sachs’ David Kostin believes a temporary pullback may explain why the S&P 500 has tumbled from its all-time high of 2,019 on Sept. 19. “Corporate bond values are fluctuating the most in more than a year as Wall Street’s biggest banks opt against using their own money to absorb debt being sold by clients. Investors are afraid that they won’t be able to get out when they want to? Precisely, and that fear is adding to market volatility. We’ve already had three dress rehearsals for Cox’s “doomsday scenario” since last summer, (the most recent of which took place last Wednesday when the Dow dropped 460 pts before rebounding.) so there’s no doubt that there’s trouble ahead. Once stocks start to fall, the bond bubble will burst igniting a broader selloff and a swift plunge in prices. That will leave the balance sheets of many corporations and financial institutions deep in the red precipitating a second major financial crisis in less than 7 years. I think so. And the problems can all be traced back to the easy money policies of the Central Bank; our friend, the Fed.